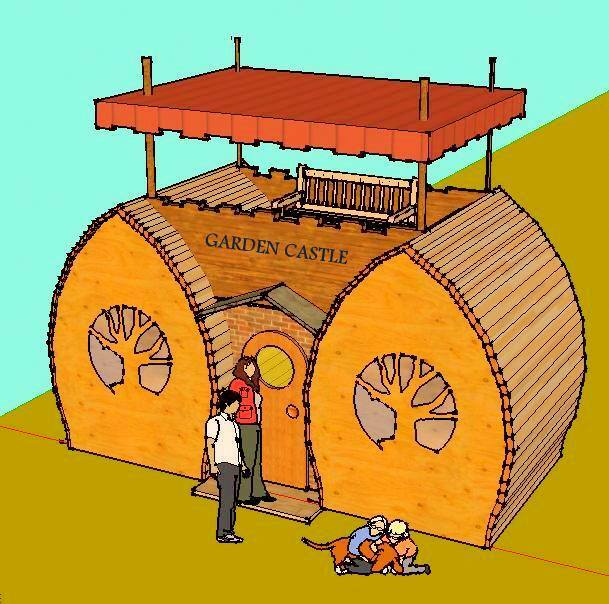 Would be great as a mini-home. 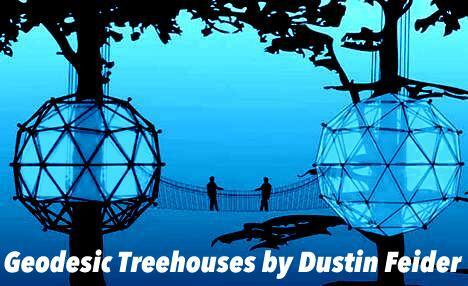 Treehouses.com - Includes instructions, plans, kits, and rentals in Oregon . 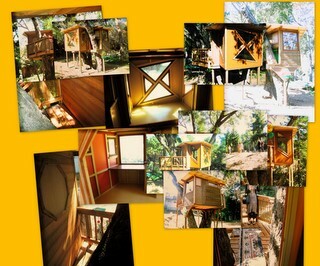 TreeHouse Book Of TreeHouse Designs and Plans Easy-to-build treehouse projects from novice to expert. 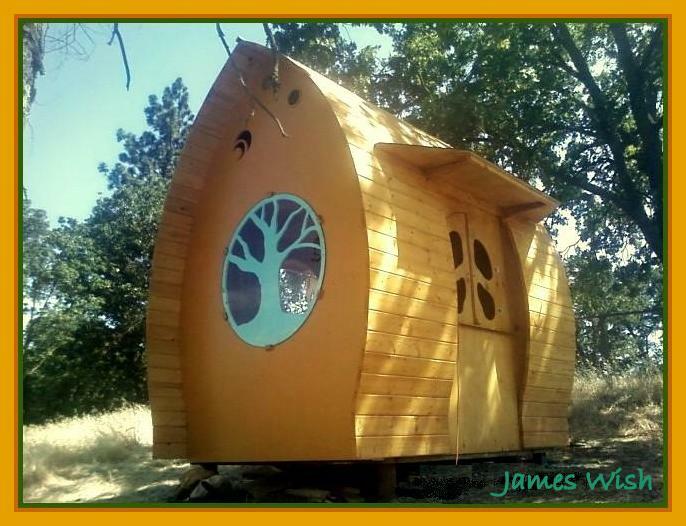 The Treehouse Camp, Maple Tree Camprground On South Mountain in Rohrersville, Maryland. 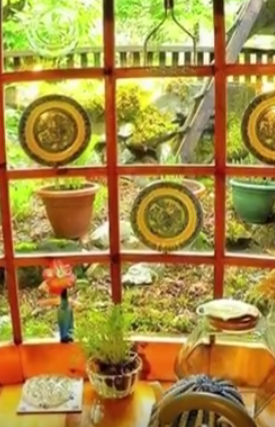 The Tree House Bed & Breakfast Inn Point Reyes, California. 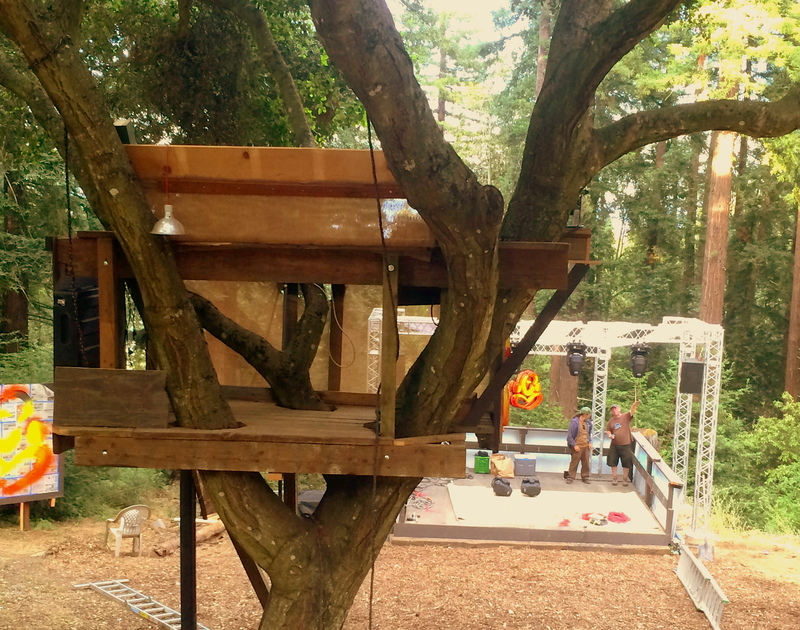 The Treehouse at SnowmassTreehouse Kids' Adventure Center, a $17M project..
Keywords: treehouse, tree house, organic, Shasta, McCloud, Mt Shasta, kids, adult, hollywood, set, build, design, Nor Cal, California, licensed, mini-home, fine, lavish, expensive, elegant, attractive, Berkeley, Oakland, Marin, Crockett, SF, San Francisco, high-end, high-grade, "top of the line", upscale, first class, classy, fancy, San Jose, zip line, Los Altos, Silicon Valley, Mill Valley, Atherton, Kensington, Santa Cruz, Mount Shasta, Sonoma, Napa, Orinda, Lafayette, Hawaii, Lake Tahoe, Saratoga, Monterey, Fairfax, Los Gatos, safe. 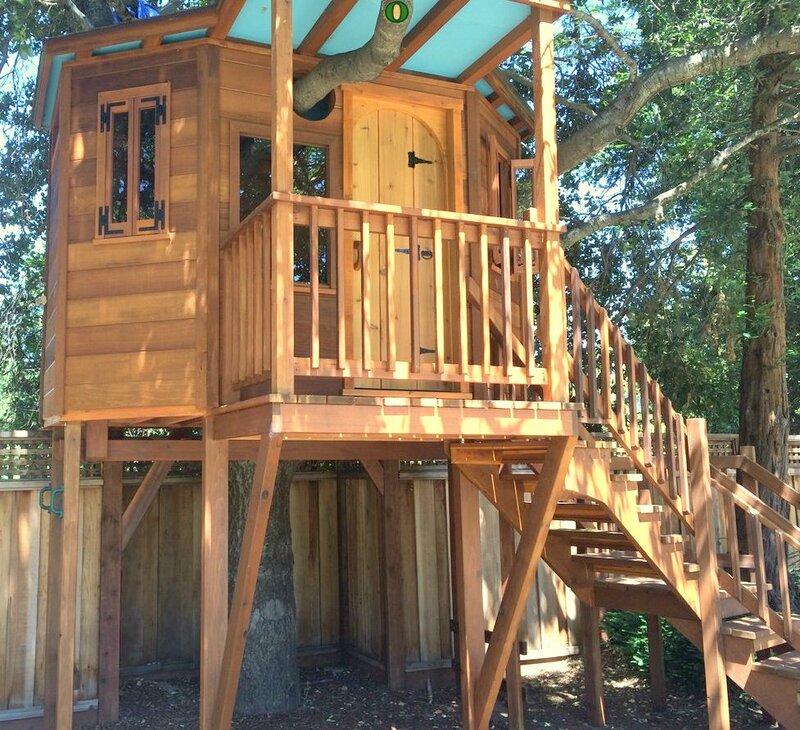 completed June, 2016: Redwood Temple Treehouse - our 3rd build in Silicon Valley. 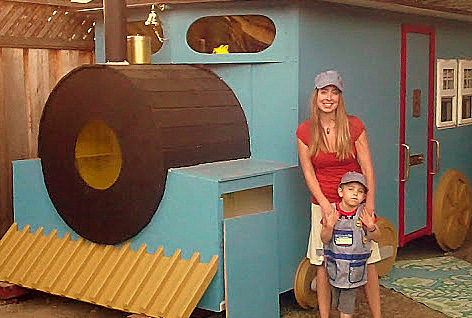 "Asher's Wish" train playhouse completed June 2012. 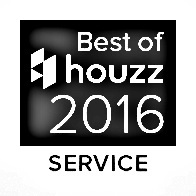 Installation aided greatly by volunteers from SF Make-a-Wish® and DELOITTE, Inc. 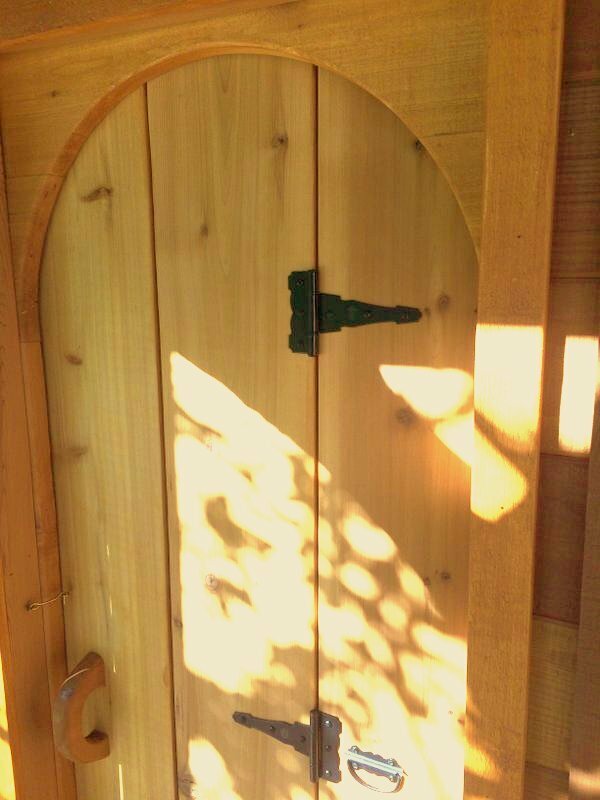 MANY THANKS TO GENEROUS DONORS: Berkeley Ace Hardware | EarthSource Forest Products | Rutherford & Singelstad | carpenter Kyle Deddo and Dan (the Tree Man) Cooley. 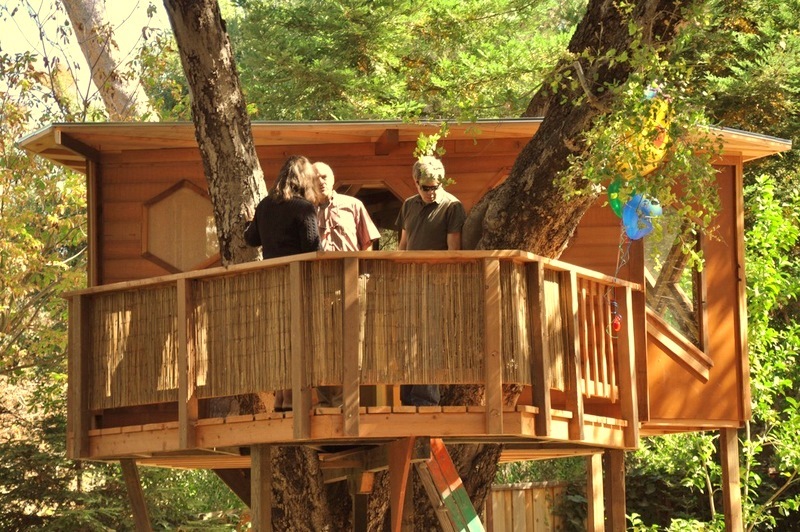 MORE PHOTOS HERE The Make-a-Wish® treehouse in Los Altos, California, was completed Sept 22, 2010. 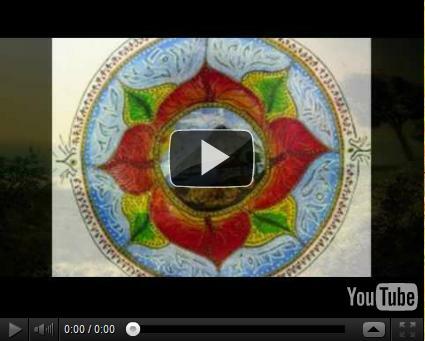 Photos below by Iolani, helper Julian's mother, and by Linda, the "wish mother". For more photos see our FaceBook page. 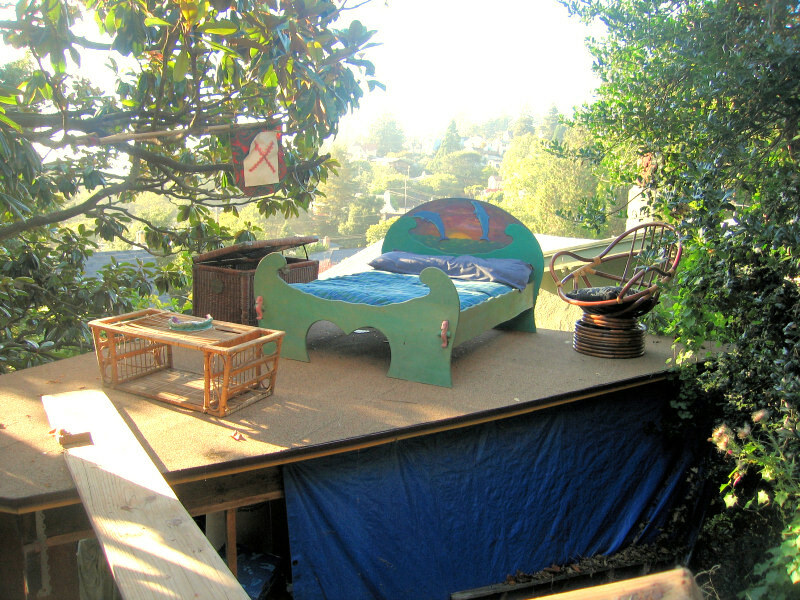 The Original Organic Treehouse - Off Regal Road, Berkeley, Calif. 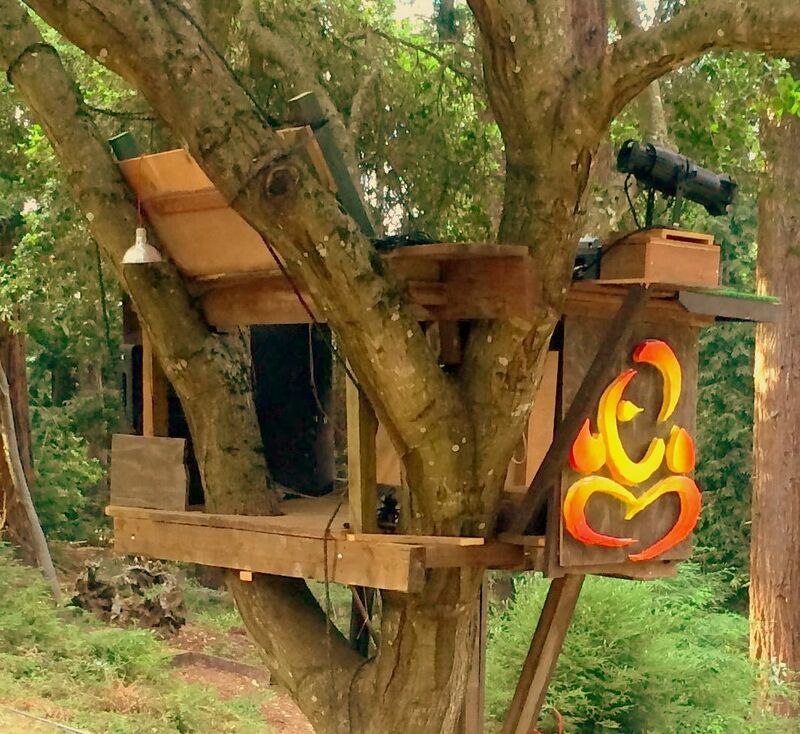 This tree house sits plop in the middle of an 80 year old magnolia tree on an otherwise vacant lot attached to and directly downhill from a fine old estate home in the Berkeley Hills. 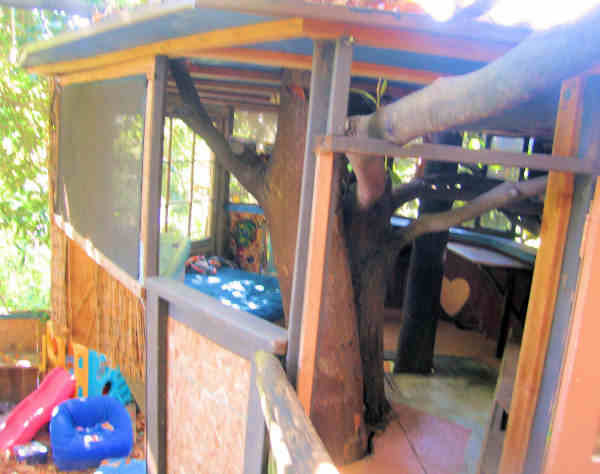 The treehouse access is easy - we built wooden stair stringers onto the slope above where a 4 foot retaining wall crosses the slope about 8 feet uphill from the trunk (see photo to left) and we built a floor platform into the tree, which became both the *front porch* access and main floor level. 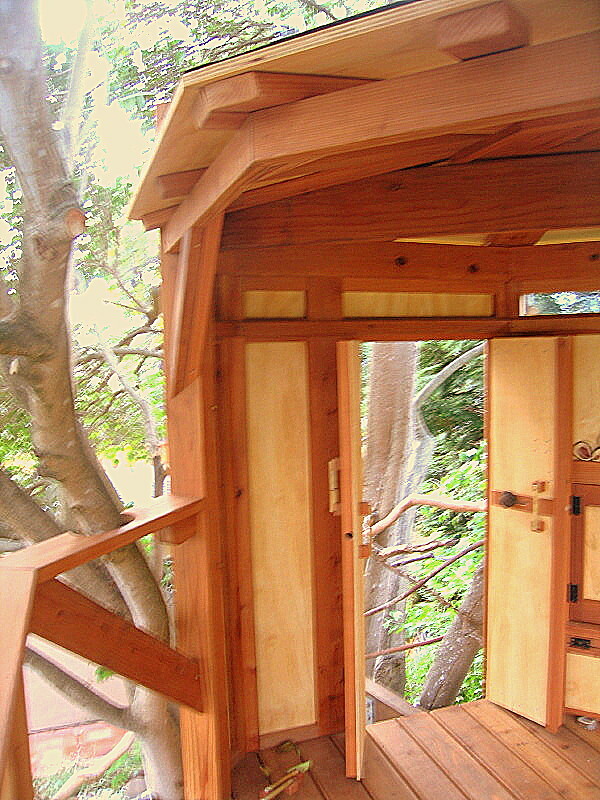 It's mainly constucted from salvaged old-growth redwood decking, and scrap CDX plywood. 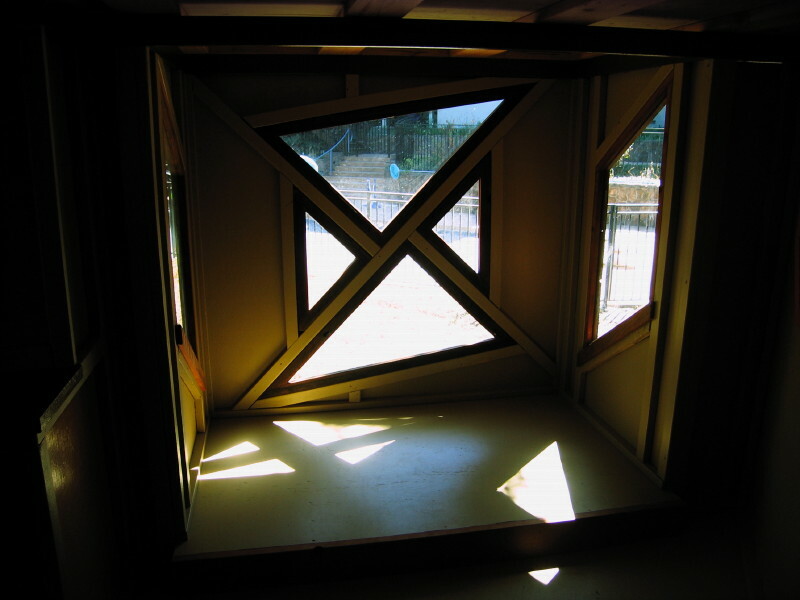 The openings are mostly screened, with one recycled wood window and a recycled door (cut to 5'6" tall) installed for security and wind break. 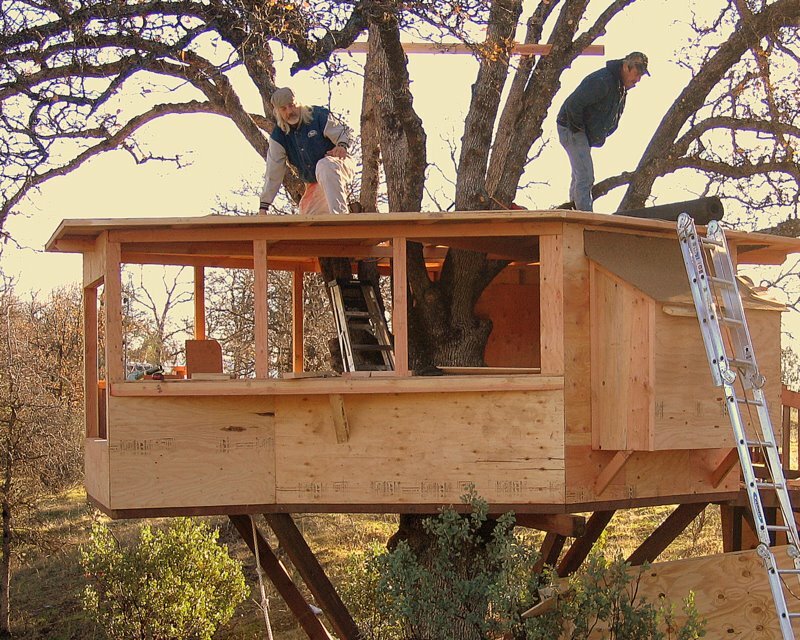 Nature abhors a rectangle, and so this organically designed treehouse was built to the dictates of the tree, and to the size and shape of available salvage. 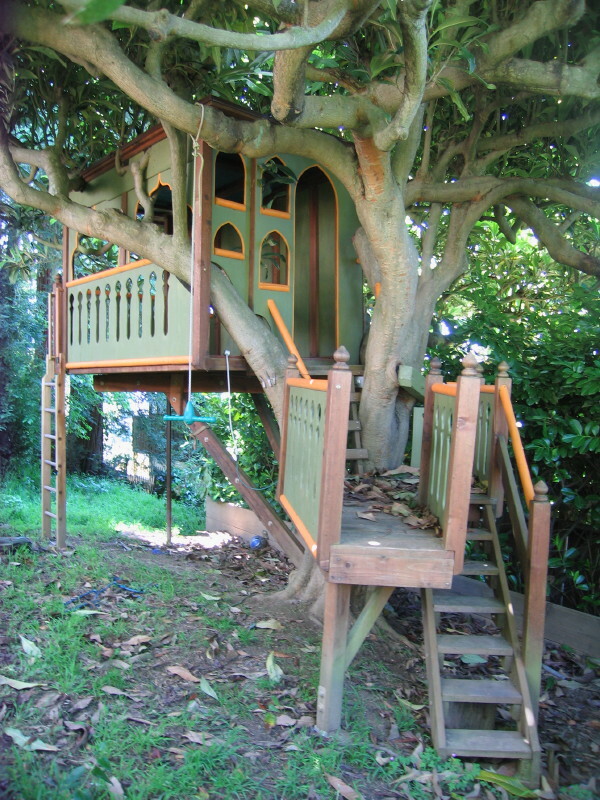 Note: we could build a treehouse much like this anywhere: in Napa or Sonoma, Mt Shasta, Kensington, Marin, Orinda, anywhere. 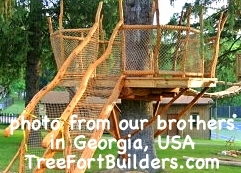 There are four vertical trunk sections that go through the roof and two smaller branches that pierce the walls as well. Waterproofing was a challenge, but was accomplshed by creating a double funnel effect (the top *funnel* is inverted, more of a pyramid flashing scheme) using skylight style curbs around the roof openings, cuttings of plastic shower curtains, and duct tape to gently secure the flashing funnels around the tree. Note: the funnels are not in evidence in these photos, they were being replaced at this time. 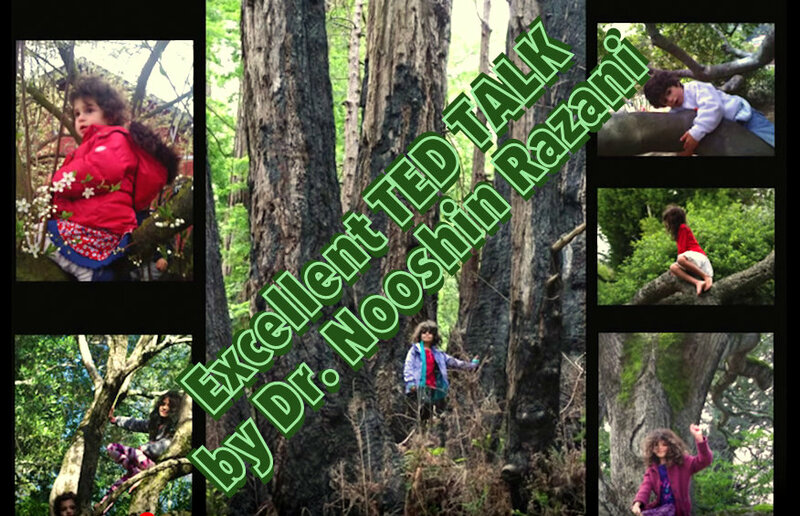 Note that no fasteners were stuck into the tree. No bolts, no nails. 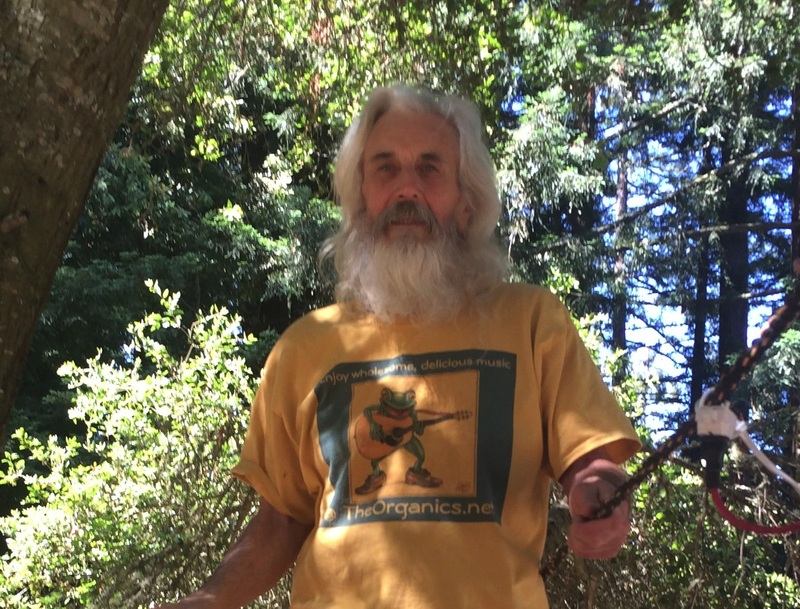 There is one main beam that was placed horizontally in the central crotch of the tree. Another beam was laid crossways on that beam at the crotch support. Diagonal supports were fastened to the ends of the beams and cut flat and wedged down against the base of the trunk. 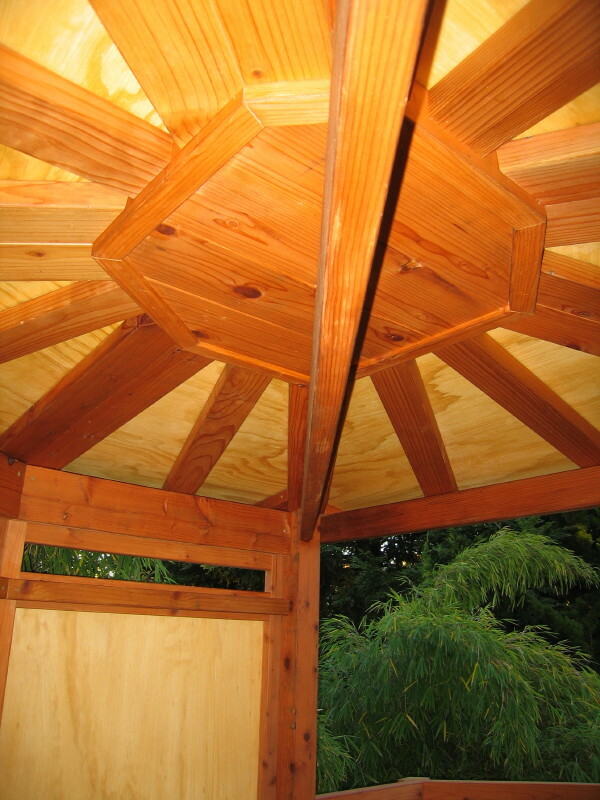 The longest diagonal, a 4x8 redwood beam, abuts the trunk, runs diagonally upward and is side bolted to the end of the main beam and continues on to be bolted to the end of the central roof joist. 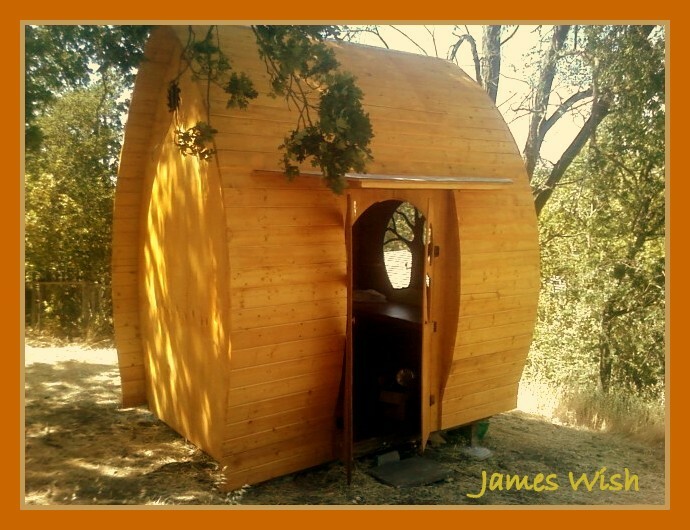 With all the massive interlocking trunks, heavy timber beams; plywood floors, walls, and roof; and supporting diagonal braces, it's sturdy as a rock, even in the highest winds. 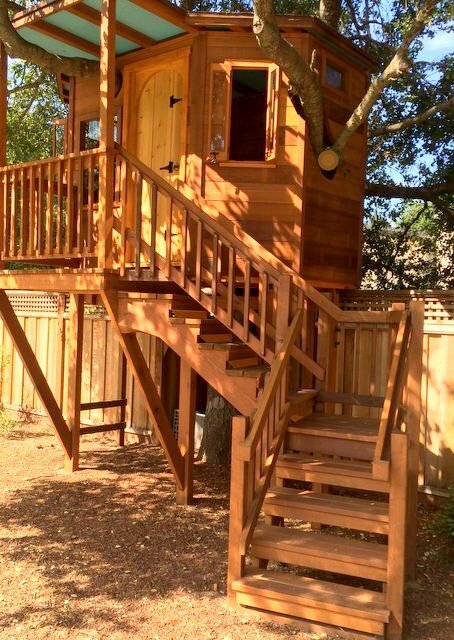 This treehouse is just under 120sf roof area, the local zoning code limit for an auxiliary structure. 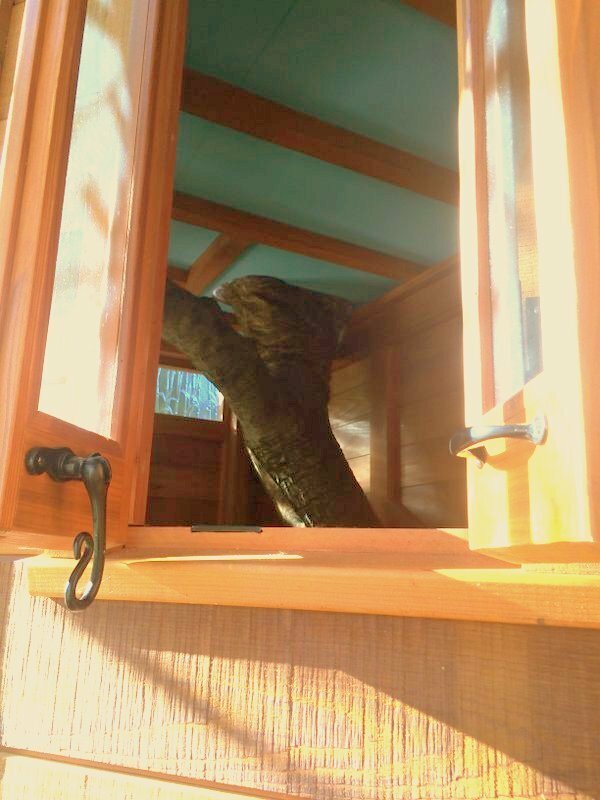 There are four discernable spaces within the treehouse interior: 1) a central walkway ~18sf that includes the space consumed by the four central trunks; 2) a 5'x 6' *bedroom* area just big enough for a custom made kid's bed (3'10" x 5'6"); 3) a 4'x 7' elevated platform - cushioned play space with a built-in TV at one end; and 4) a ~19sf study area with a 180 degree built-in desk and shelves. The ceiling is six feet high off the main floor. Only two small branches were removed. 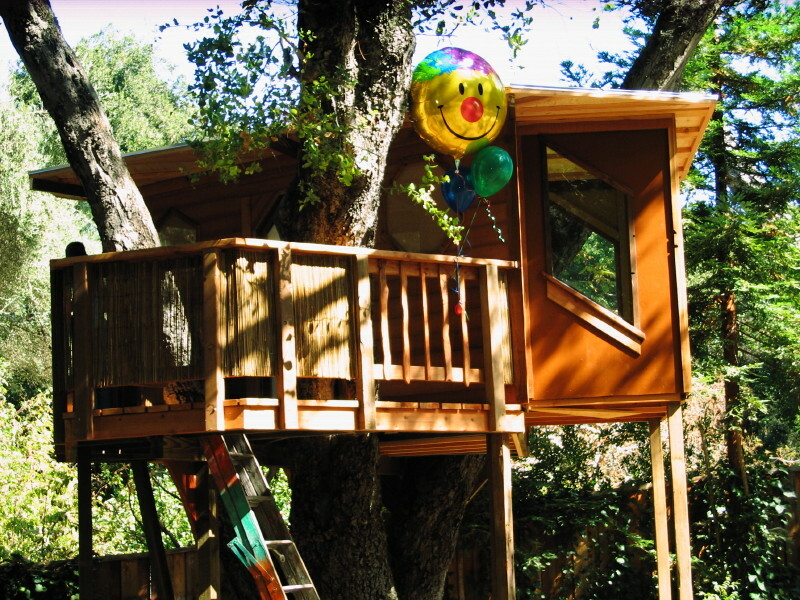 Note: we could build a treehouse much like this anywhere: Napa and Sonoma counties, Mt Shasta, Marin, or Orinda, anywhere. 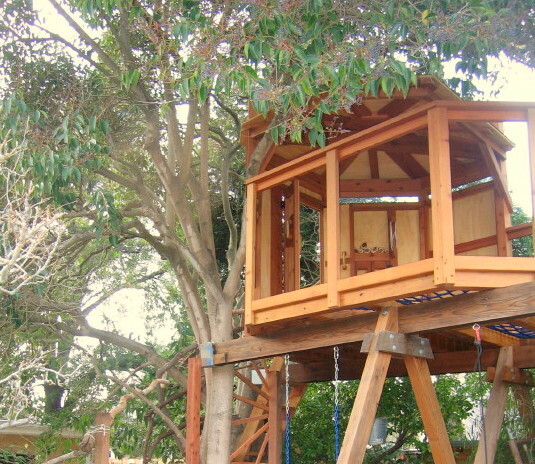 Originally, this treehouse was designed with one or another of our children in mind. 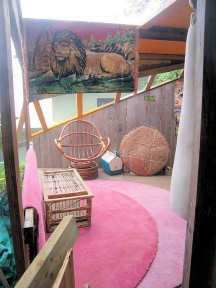 The bed was designed especially for our oldest daughter in 1993 when she was eight. The custom mattress is only 5'4" long. 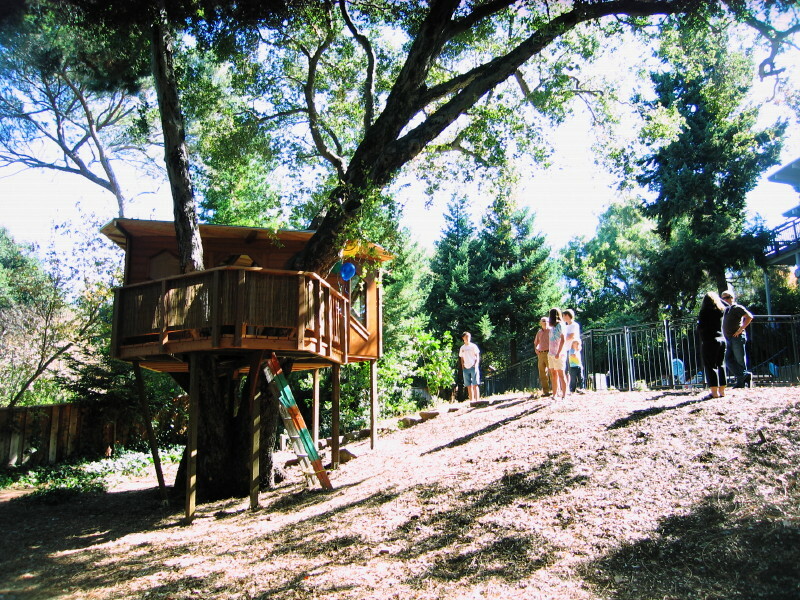 In 2000 she was too mature to enjoy a treehouse (but she helped paint it), and her younger siblings for one reason or another desired to stay indoors. 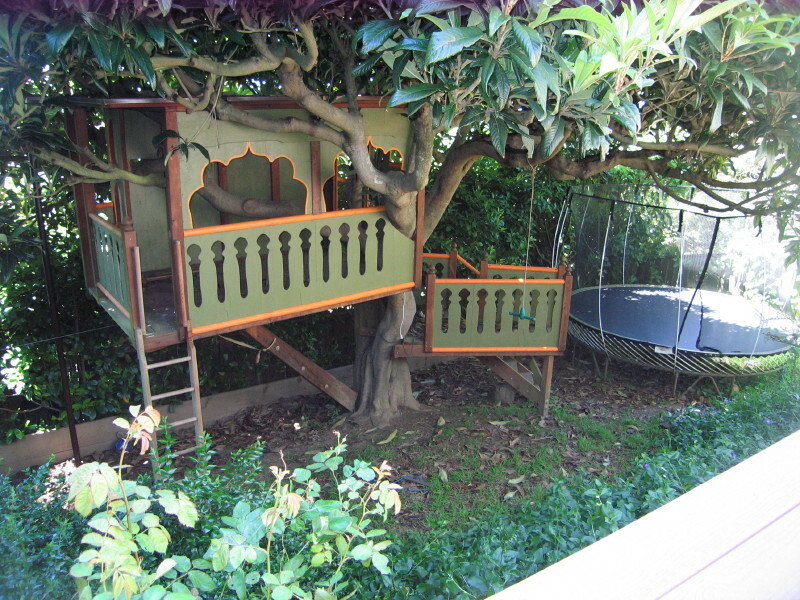 The treehouse was abandoned to the devices of the Papa of the family, i.e. me. I gladly put it to use. I ran a phone line, tv cable, and heavy duty power cord, set up the computer my dad had given me, and went into creative delirium. It was perfect place to let the mind loose and the ideas flow. I indulged my fledgling hobby, creating websites, and eventually serving as volunteer webmaster for a local public access radio news show. 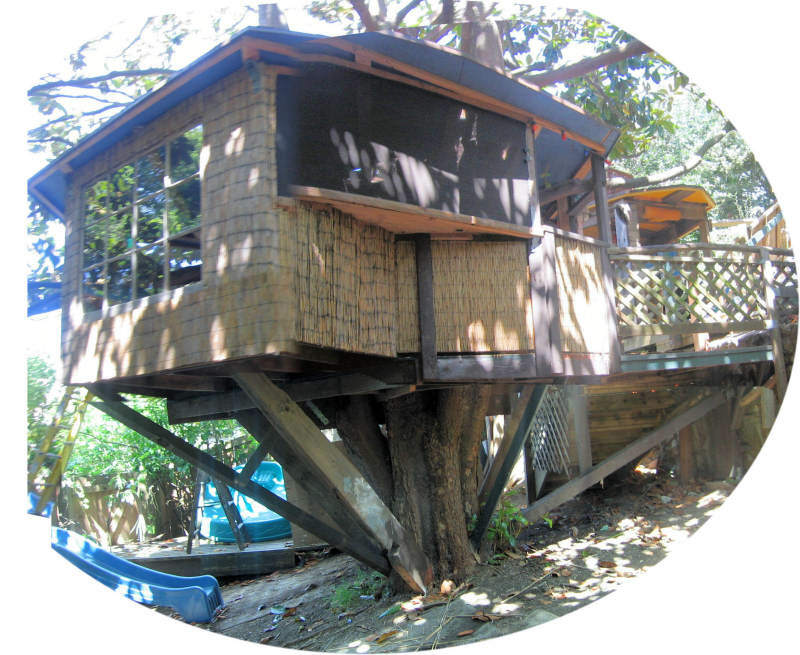 For a couple years I even operated a small independent insurance adjusting business from the treehouse. This bed was built in 1994 for our oldest daughter, then 9 years old. 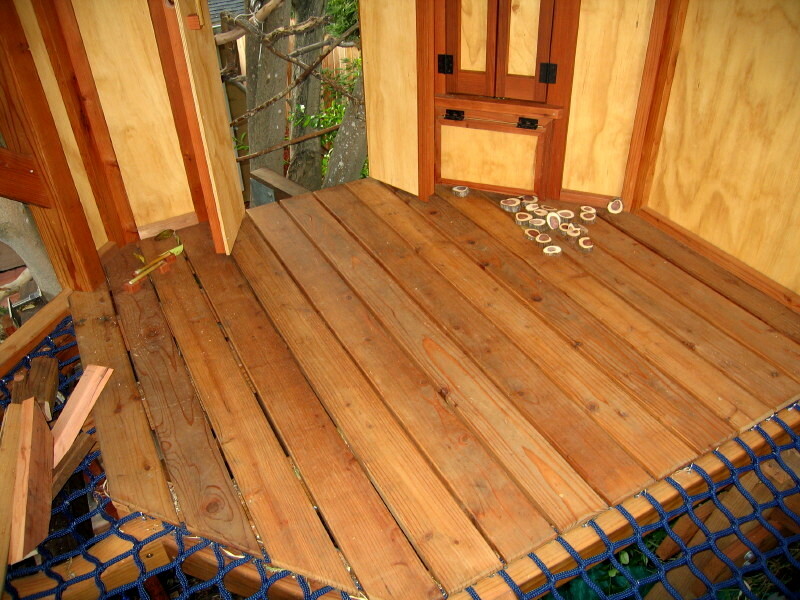 In constructing the treehouse, I started by building a platform large enough to accomodate this bed. It's called "Dolphin Dreams" and has a custom painted headboard, with spinning dolphin cutouts. It's my retirement fantasy, to open a shop in Hawaii somewhere, "Bob's Big Island Beds ," where tourist folk can custom paint a 1/4" thick wooden panel that I then ship to a local cabinet maker affiliate buddy on the mainland to fit into a headboard on a bed like this and deliver it to them when they get home. This structure has been removed to Berkeley's upper Marin Ave, Cragmont Elementary School as a gift to the garden department. 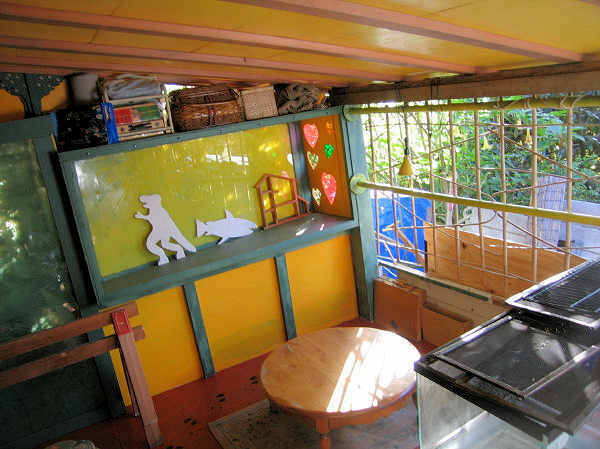 It is a wonderfully creative space, shaped like a cross between a diamond and a triangle. Flat roof. 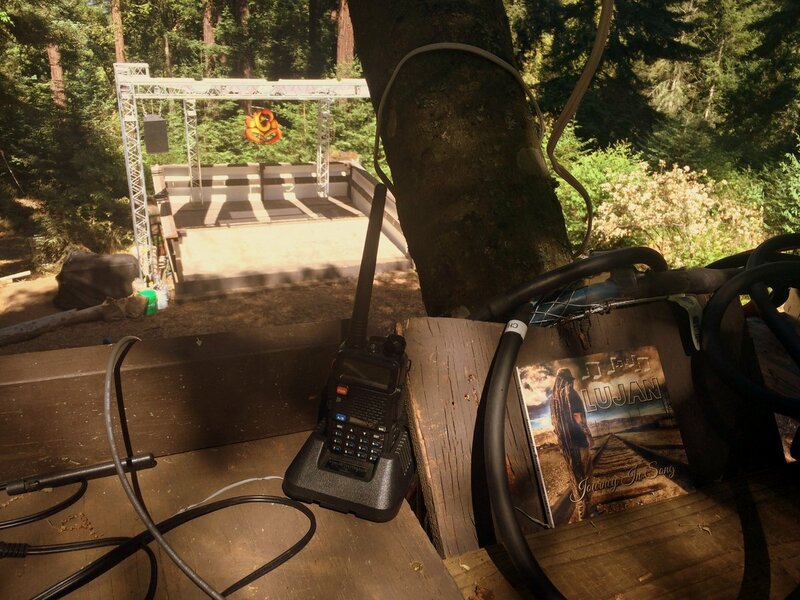 Salvage timber construction with Simpson steel connectors for strength. Sturdy. Fun to be in. Notice the ceiling. 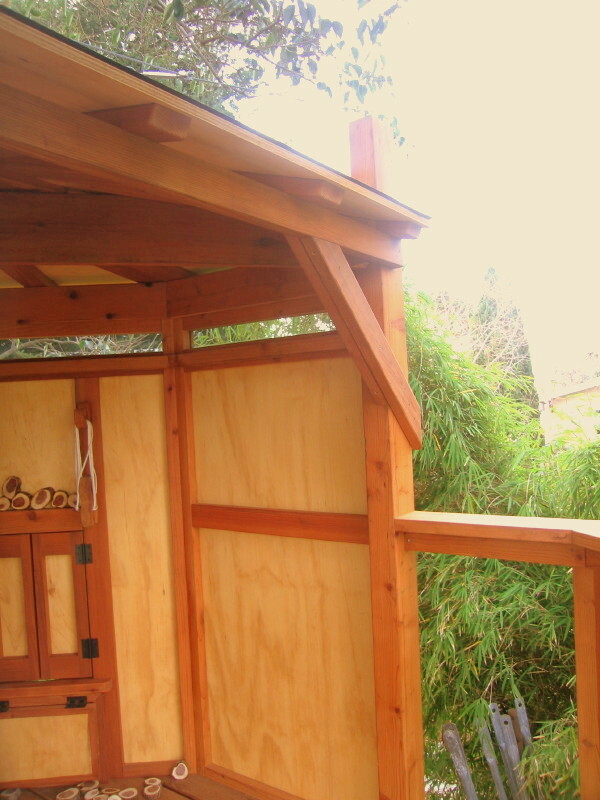 When I build an outdoor space like this, I like to prepaint the underside of the roof plywood (i.e. the ceiling) and prepaint the ceiling joists (in this case flat-laid recycled full dimension fir 2x10s) so there's no masking required but you still get a crisp clean line. 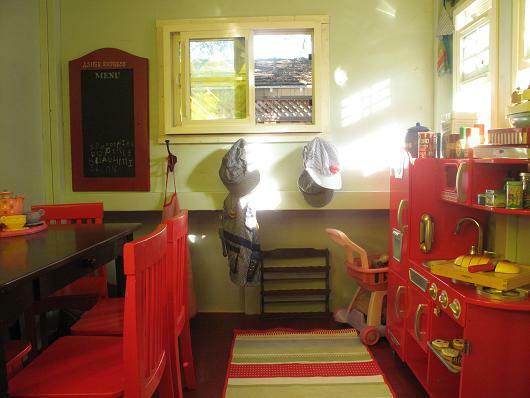 I like a light ceiling color (yellow here) with darker joists for an attractive contrast. 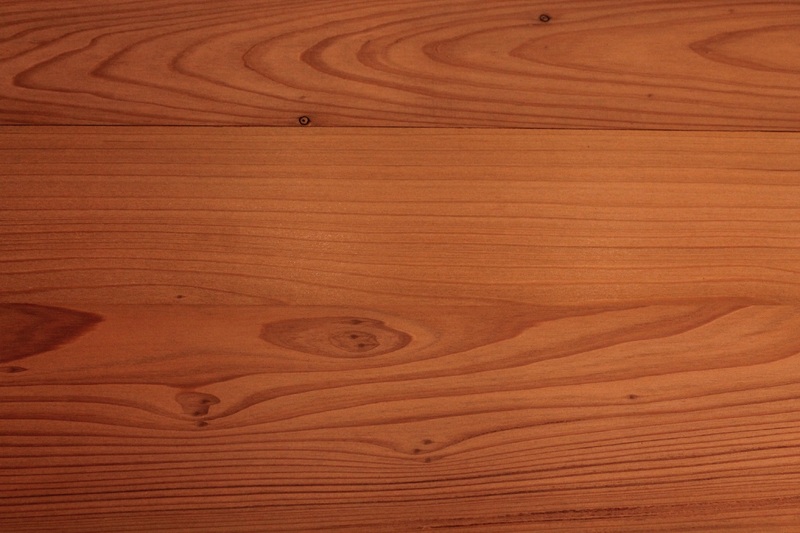 These are rough timbers and plywood, but the effect is neat and pleasing (and easy to do). It's a delightful thing about Berkeley and the Oakland Hills, and really, the entire SF Bay Area, is that you really don't need to be inside over much. You can practically spend your entire summer out of doors, it never seems to get too hot, there are few bugs, flies, or mosquitoes. 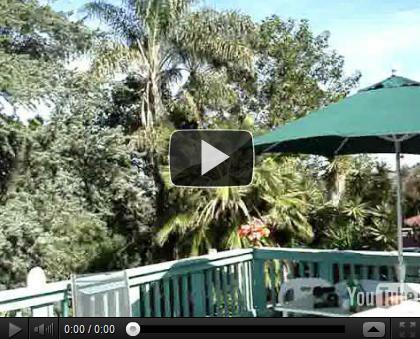 Everyday from April to November seems like just anther day in Paradise. It rarely rains in those months, and in the other months, in winter, it never freezes, and there are lots of warmish days even in Janurary and February. For some reason, our son (8-9 years old) was inspired to set up action figures and trucks and bulldozers inside on the floor of the "captain's quarters" of this *pirate ship*, he named "The Chain Chomp" and create elaborate story lines that he persuaded me to help him act out, even video and edit a couple of them. The rear wall is actually a pre-existing privacy fence (set back about 7' from the property line) that I built about four years previous. When I build structures like this I try and make them easy to take down and reassemble if needed, using bolts and screws where possible, rather than nails. The open roof area in this photo was a photo-op thing, the pirate ship was being disassembled to move it to the local elementary school garden. I gussied the bones up and took some good-bye photos. 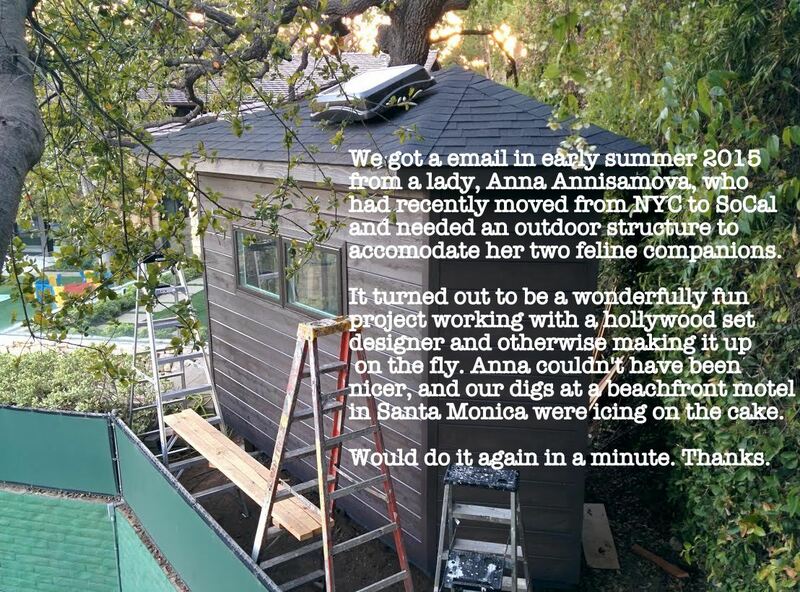 It was sad to lose this structure, it was so thrilling to be creative inside of it. This is the entry side, the north end of the structure. 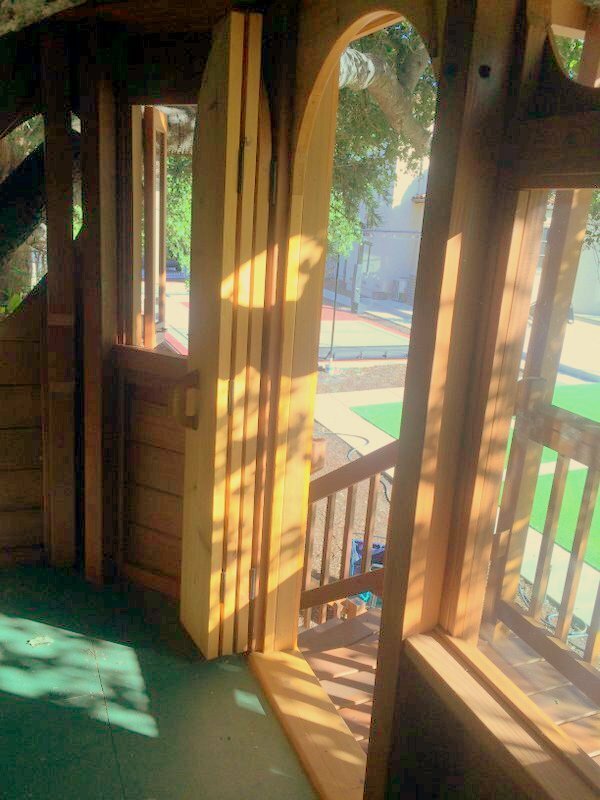 The little porch area was designed as a safety measure, a mid level stair landing, converted by the owners into a jumping off site, and now a rope climb. 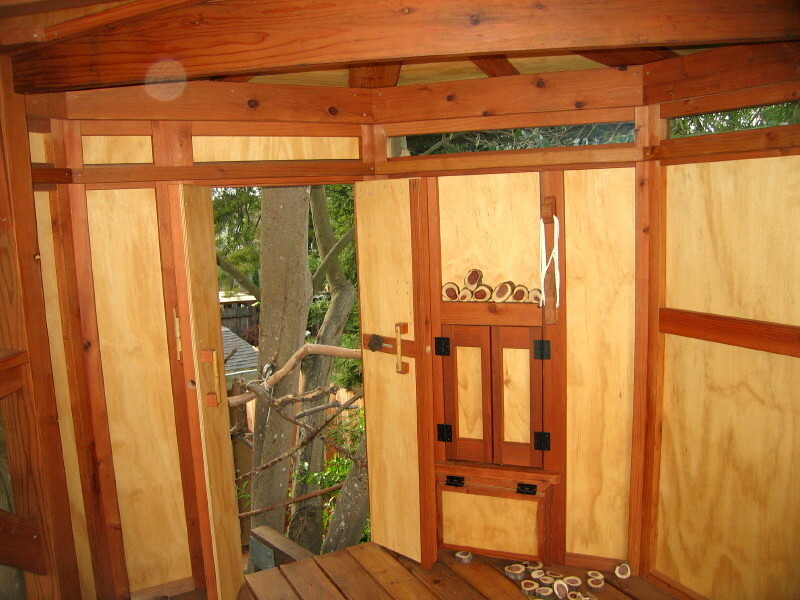 The curved tops of the window and door openings, and the vertical cut-outs in the plywood railings are designs all borrowed from the Taj Mahal in India. The floor area is about 80 sf, the roof about 100 sf. 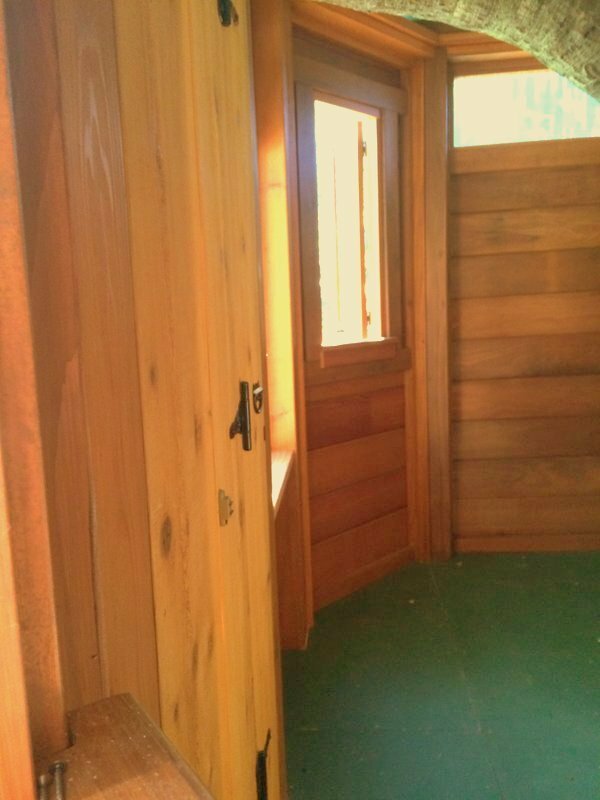 The west side of the enclosed structure, the ocean / sunset / Golden Gate Bridge view side, sits back exactly 3 feet from the property line, and accordingly has no window or other openings out of consideration to the downhill neighbor. Most of the weight of the structure is carried by one laminated redwood beam, made from 3-2x10s, which is carried by a matching laminated diagonal support. 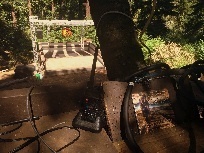 The north end of the horizontal beam is connected to the long tongue of a massive steel Simpson T-bracket, and the short side of the bracket is bolted to a 3 foot long piece of pressure treated 6x10 which locks through a fork in the trunk, preventing the beam from moving horizontally. The top of the diagonal beam is bolted to the horizontal beam and the bottom is fitted to the trunk and fastened with lags. 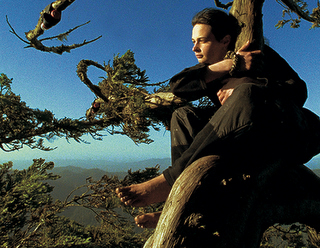 The city is Berkeley again, tree is a magnolia again, a fine breed, a strong, attractive tree for building treehouses. Note that no tree trunks or limbs were cut or damaged in any way for or as a result of the construction of this tree house. Veiw the enlargement. 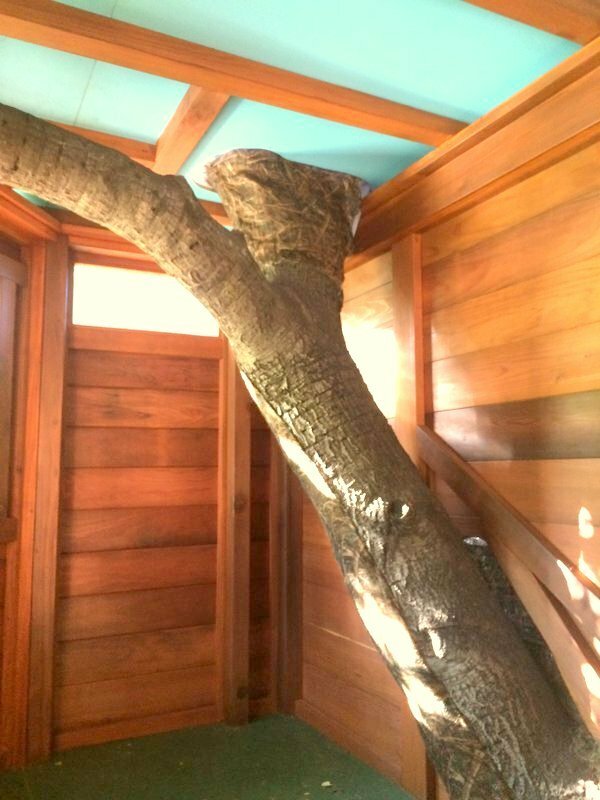 See the odd twisting limb that runs through the middle of the structure, splits in three, two limb run vertically through the roof, and one through the west wall. None provide support (see above). And notice at the far rear left of photo, another small limb running through the wall at the corner. 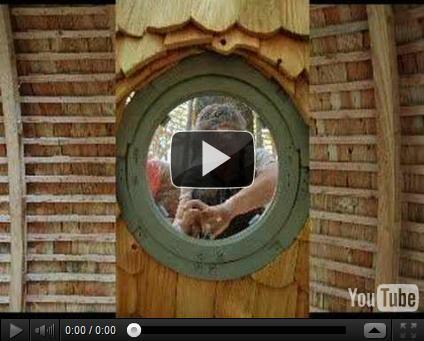 It's these quirky twists and turns that really made this fun to build and fun to be in. 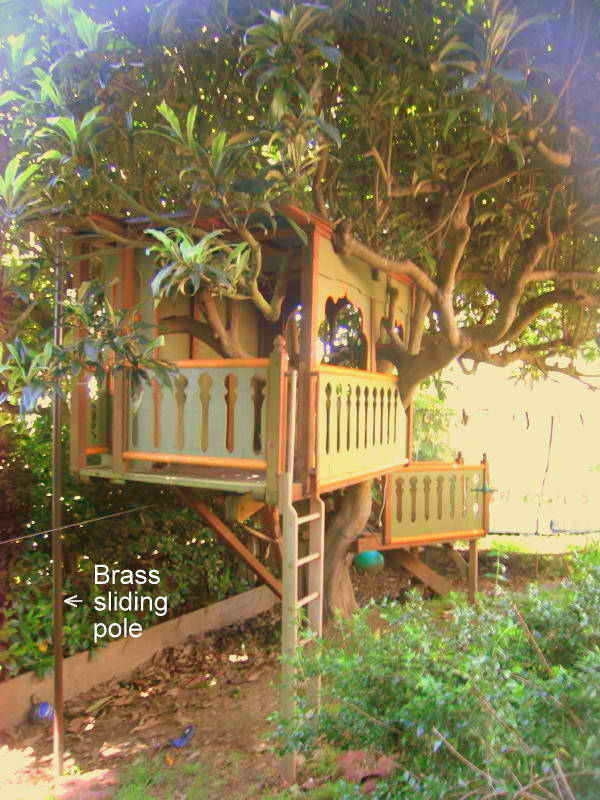 Note the brass fireman's pole, accessible from a foot wide offset in the wood railing. 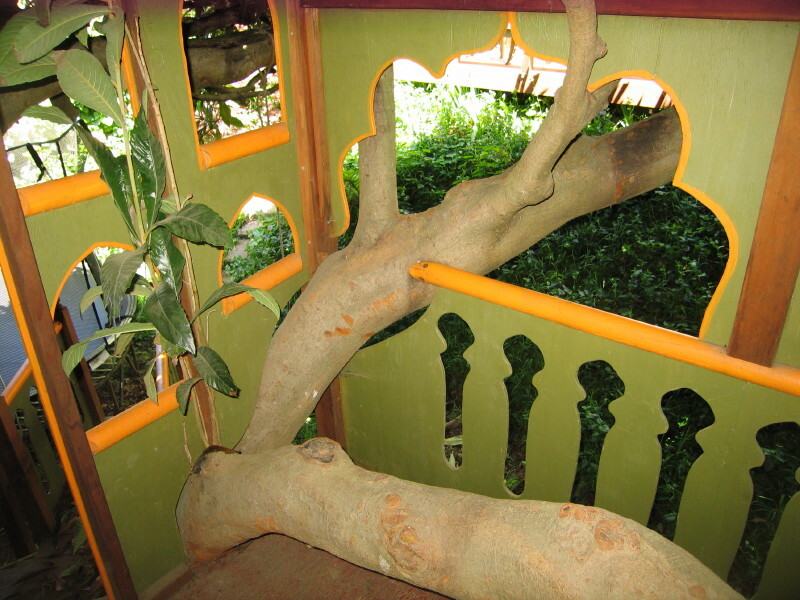 Side view of view of Taj Mahal treehouse from the east / main house. Notes on trees and spiritual practice: It's probably no coincidence that Prince Siddhartha / Gautama Buddha reached enlightenment sitting under a tree, specifically a very old and very large "Sacred Fig" tree, which tree become famous as the "Bodhi Tree" (Tree of Enlightment). 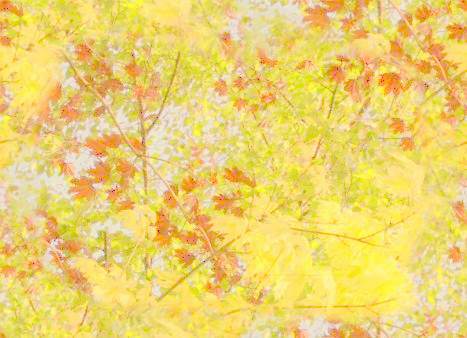 Trees channel more than sap. 1. . -- And, of course, Jesus customarily went to pray in the "Garden of Gethsemane", an olive orchard at the foot of The Mount Of Olives. 1. 2. 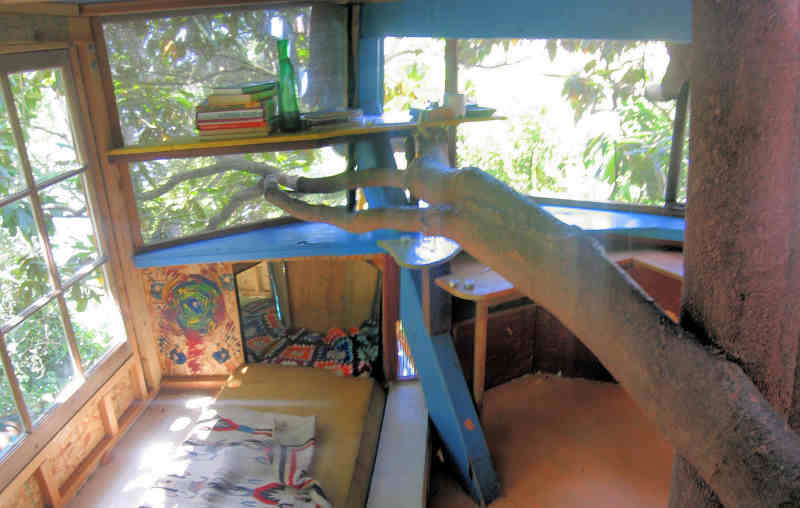 Open Exchange, April 2010:"I've been living in and out of a treehouse for about nine years. It's changed my life. In that time, I've become more creative, more involved, clearer, happier, healthier, and a better person. That was the first treehouse I ever built, I had always loved trees but never before had the opportunity to build a treehouse and occupy it. 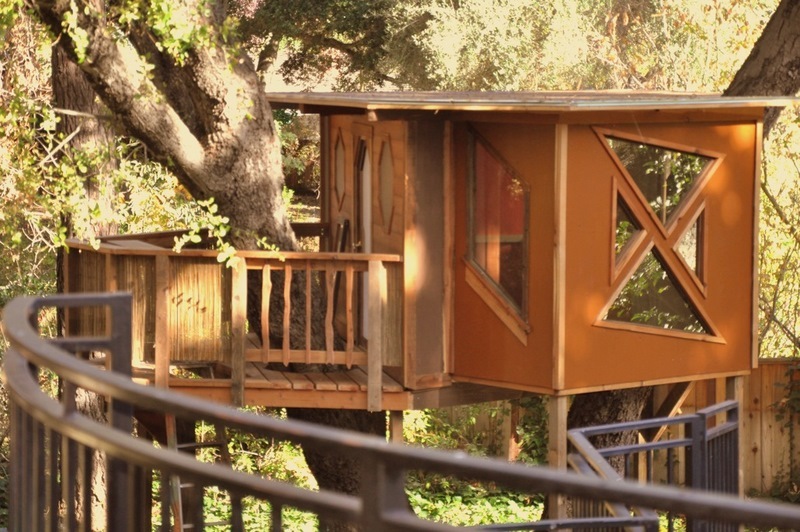 The bay area is a near perfect climate for treehouse living. 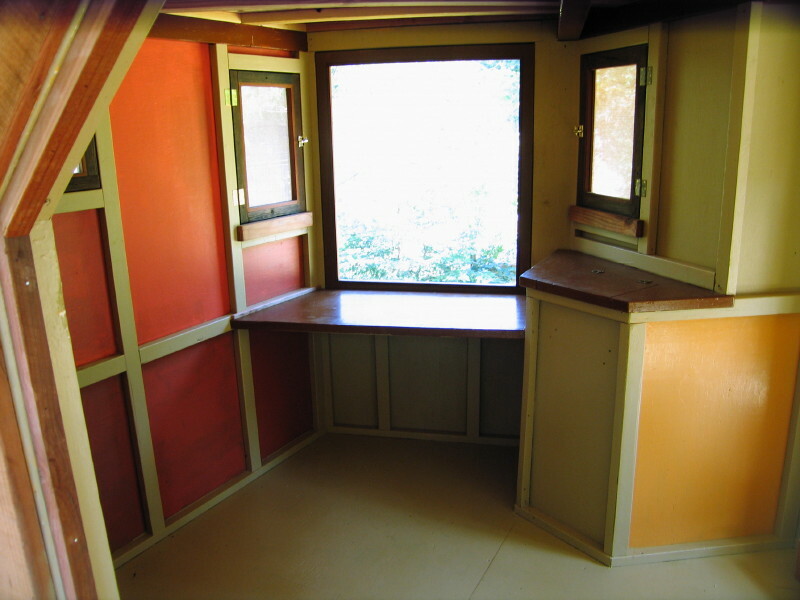 Being in a treehouse can help you ground out, facilitate meditation, promote restful sleep, keep you in touch with the real world. 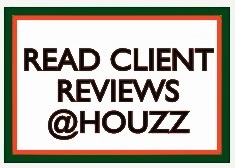 Let me help you build yours. " John Lionheart, builder. Thanks to http://www.favicon.co.uk/ for the free favicon generator.